The kitchen in many older houses has an undersized window, and replacing it with a larger one is one way to visually broaden the space. Enlarging a window opening isn't a difficult framing project, but it usually involves changing the size of the header, which supports the weight of the wall above the window. You can save money in this regard by nailing together two lengths of two-by-four lumber to make a 4-inch header. It's best to cut any exterior siding after doing the framing to make sure the hole is exactly the right size. 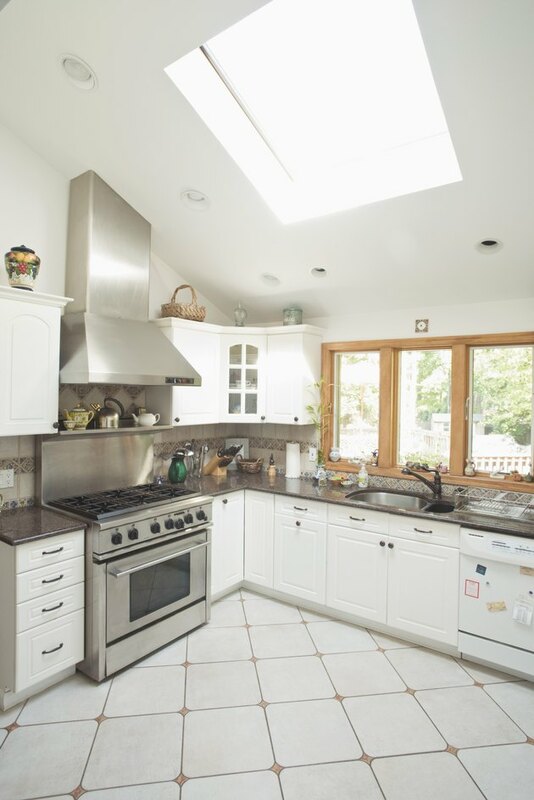 Large windows brighten a kitchen and make it seem larger. Pull the trim from both sides of the old window with a pry bar. You don't have to do it carefully in an attempt to salvage it because you'll need new trim for the enlarged window. Remove the fasteners holding the old window. If the window has a flange attached to the framing on the outside of the house, pull out the fasteners with a pry bar. If nails are holding the window to the framing, insert a reciprocating saw between the window and the framing and cut the nails. Pull out the window. Pry out the old window frame, starting with the sill, then the header and finally the trimmers on either side. Remove all the framing from above and below the old window. Measure the width of the new window with a tape measure, add 3 1/2 inches, and position two two-by-four king studs that distance apart on either side of the window opening. Make the studs -- which should extend from the top to the bottom plate of the wall -- equidistant from the center of the opening to keep the new window centered. Plumb the studs with a level and nail them to the plates. Mark the position of the top of the window on one of the king studs and measure the distance from that mark to the bottom plate. Cut a piece of two-by-four lumber to this length and nail it to the king stud. This is a trimmer that will support the header. Make an identical trimmer for the other side of the window. Measure the distance between the king studs and cut a header to that length. Use 4-by-6-inch lumber if the distance is from 4 to 6 feet, and 4-by-8-inch lumber if the distance is from 6 to 8 feet. Set the header on the trimmers and nail it to the king studs. Measure the height of the window and make marks on the trimmer that are this distance plus 1/2 inch below the headers. Cut a sill that is the same length as the header and nail it to the trimmers with its top face on the marks. Install support studs under the two ends of the sill and nail them to the sill and bottom plate. Fill in the rest of the framing by installing cripples between the top of the header and the top plate and between the bottom of the trimmer and the bottom plate. Space these cripples by 16 inches. Drill a 3/4 inch hole through the siding to mark the four corners of the window opening. Go outside and draw lines to connect these holes with a pencil and a straightedge, then cut along the lines with a circular saw to make the new window opening. Install the window according to the manufacturer's recommendations.